Most people think talent is genetically determined. Either you can sing or you can’t. You get calculus or it’s beyond you. You have what it takes to succeed — or you don’t. The truth about human performance is far more encouraging, says Dr. Bob Rotella in Life Is Not a Game of Perfect. Dr. Rotella, the bestselling author of Golf Is Not a Game of Perfect and Golf Is a Game of Confidence, believes that talent, as conventionally defined and measured, plays a secondary role in determining one’s fate. Far more important is real talent, a combination of character, attitude, and devotion, which makes greatness possible. And the good news is that anyone can develop real talent. As always, Dr. Bob Rotella speaks from experience. He has made a career of helping people chase and catch their dreams. His authority as a sports psychologist is well known. Golfers from Tom Kite to David Duval to Pat Bradley have relied on him to help them break through to triumphs on the PGA Tour. But Bob Rotella’s practice extends beyond the sports world. He is a consultant on performance enhancement to leading businesses such as Merrill Lynch, General Electric, and PepsiCo. He has worked with successful people in businesses ranging from law to entertainment. From hundreds of clients and countless students, Dr. Bob Rotella has learned what works. In Life Is Not a Game of Perfect, he shares what he has learned and what he teaches his clients. Real talent, he explains, is “brilliance of a different sort.” It is the nerve to choose a career doing something you love or the ability to learn to love what you do. It is courage, persistence, and determination. It is the ability to handle failure and honor commitments. Whether you think so or not, real talent is within your grasp. 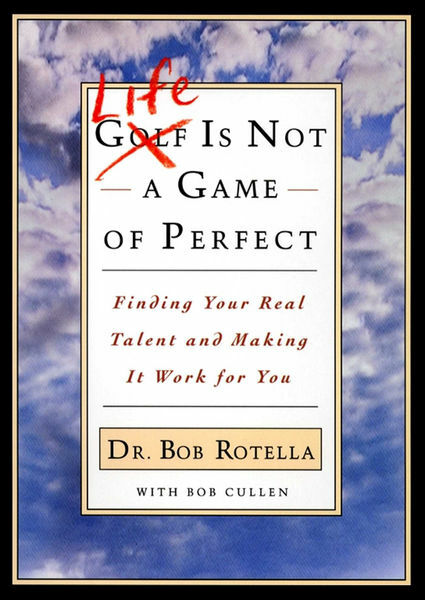 In Life Is Not a Game of Perfect, Dr. Bob Rotella will help you make it a decisive element in your life. He can show you how to identify and cultivate the qualities that lead to success, prosperity, and happiness.